Mumbai, Aug 27 (IANS) All-round efforts helped Bengal Warriors beat Bengaluru Bulls 32-26 in the fifth edition of the Pro-Kabaddi League (PKL) here on Sunday. Surjeet Singh scored eight tackle points for Bengal while Rohit Kumar scored seven points for Bengaluru. Jang Kun Lee also chipped in with six raid points for Bengal Warriors. Bengal now have 27 points after eight games and Bengaluru have 23 points after 10 games. Jang Kun Lee opened Bengal’s account in the first minute with a raid point. Bengaluru in the next three minutes scored four points to lead 4-2. Deepak Narwal scored a two-point raid in the sixth minute to level the game at 4-4. Both teams were cautious in the first 10 minutes and scored just a point till 5-5. Rohit Kumar had a quiet first half as did Jang Kun Lee. Bengaluru led 8-7 after 15 minutes. Bengal Warriors scored four points in three minutes as they went into the break 11-9. 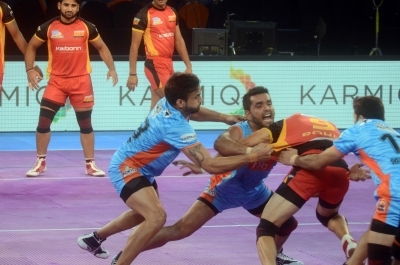 Bengal began the second half with a bang as Virender scored a four-point raid as they led 16-10 after 22 minutes. Bengal Warriors then forced an all out in the next minute to lead 20-11. It was Bengaluru’s defence which tried to keep them in the match as Kuldeep Singh achieved a high five. In the 33rd minute another tackle point by Bengaluru reduced the deficit to seven points. Bengal Warriors led 28-21 after 36 minutes and looked in control of the match. Surjeet Singh was a rock at the back for Bengal as he scored eight points. Bengaluru tried to make a comeback in the last five minutes but Bengal held strong. Bengal won 32-26 at the end of the match.